Puppet it! - creative entrepreneurship - Stowarzyszenie Młodzieżowych Inicjatyw Twórczych "CREATOR"
SMIT "CREATOR" is happy to announce that our YE Puppet it! - creative entreprenership was approved! The Youth Exchange﻿ will be held in Rabka-Zdrój, Poland from 23 to 30 September 2014, and will bring together 40 young leaders and volunteers from 8 European countries. "Puppet it! - creative entrepreneurship“ was a multilateral, international youth exchange project held between 23-30 September 2014 in Rabka-Zdrój. Town being the most famous SPA resort for children in Poland, which is the main reason to implement project exactly in there! Youth exchange was responding to youth needs due to difficult economic conditions and their will to improve skills. Main objectives of exchange was to raise awareness about a sense of initiative and entrepreneurship that help to increase people chances for employment in the competitive labor market. To underline those entrepreneurial skills can also help young people adapt to other career paths and to intercultural working environment, especially with nowadays migration rate in Europe. How to use recycled materials in creative way in order to learn how to start up own business. Moreover, to promote intercultural dialogue and free exchange of European values among youth. During a whole week of various and challenging activities using non-formal education methods and tools 40 youth workers, volunteers coming from 8 different European countries, namely – Cyprus, Czech Republic, Italy, Latvia, Lithuania, Poland, Portugal, Romania have learnt how to launch their own business by getting different entrepreneurial skills and practical knowledge. As an example of "start-up" participants have learnt how to make by themselves puppets/dolls using recycled materials which were used in creation of comic book with useful tips how to start up own business step by step. Puppet It! Creative Entrepreneurship youth exchange was a great project organised by SMIT “CREATOR” NGO i Rabka – Zdrój. Topic of our activities was raising the interest of entrepreneurship among youth. We met people from different countries and shared our points of view on starting business career, advertising or start – ups. This experience gave me exclusive opportunity to learn something new from young people from such far away located countries as Portugal or Cyprus. I'm sure the experience and knowledge I gained at this training will be very useful and important in my future. The youth exchange "Puppet it! Creative entrepreneurship" was a project organized Stowarzyszenie Młodzieżowych Inicjatyw Twórczych "CREATOR" from 23trd-30 September and I had an opportunity to participate in it. The youth exchange took place in Rabka­Zdrój, the southern Polish city, famous for its spas and highland climate. For the entire week I had been developing leadership, managment, team-building and creative thinking skills ­ all which is needed to become more competitive in the future labour market. Together with people from Cyprus, Czech Republic, Latvia, Lithuania, Italy, Portugal, Romania and of course Poland we've learnt will learn how to launch our own business by getting different entrepreneurial skills and practical knowledge. Work in an international and multicultural environment is becoming more and more common. According to this the cultural diversity of the project was certainly an advantage of this exchange. Activities like creating and presenting the advertisement of the product were designed to learn how to work under the time pressure and how to efficiently solve problems. “Puppet it!...” was an interesting experience. It helped me to understand the mechanisms related to entrepreneurship aspects. A project that combined intercultural exchange with entrepreneurship skill development was established in a fun and creative way in Rabka Zroj. Thanking the organizers for a program that included business plan design with handcrafts skill with hand on practice on creating puppet out of everyday items. With upcycling methods our puppets came to life with videos and other publications ready to teach our youth with non-formal methods on how they can sustain a small business with little basic knowledge on economics as well as developing critical thinking about ideas that can become reality. This project practiced a series of competences and introduced Erasmus+ respectively. We had a excellent time and multicultural experience in Rabka Poland, during the YE "Puppet it! Creative Entrepreneurship"
Excellent group with participants from very different parts of Europe worked together on their soft skills towards an excellent program about young Entrepreneurship. Very well conducted by the organizers, and with a comfortable and safe environment, making sure that the young participants from different countries and cultures were eager to learn from each other and work together in the tasks assigned to the group(s). Rabka is a really beautiful and small village in the mountains, which allowed us to have a very relaxed environment to work, the conditions of the hotel were great, we can only thank for the way everybody dealt with us. As Team Leader for Portugal, this was my second project as participant and I was happily surprised to being able to cooperate in some parts of the program. The Team Leaders meetings were very interesting with everybody putting their input on the project building an even better union to the group and allowing us to open our network to our NGO's. I'm extremely happy that I've been involved in this project, and I'm looking forward to work with SMIT CREATOR on next projects. We had the time to make interesting group activities and we had the possibility to talk about that. From our point of view the presentation of the different results of the group activities and the discussion with all the participant was the most important thing (immediate feedbacks). We are happy because we had the possibility to talk (several times) all together about the project and our ideas. Another important thing about the project is that we had the feeling that all the activities were connected and that we were working for our final goal. We learned a lot about team working with different people and in different situations (stress-tired). We also appreciate the fact that the people of SMIT “CREATOR” were always ready to listen our suggestion and make some changes if it was necessary. Our evaluation about the project is positive. Thank you for your project "Puppet IT", I have met very many interesting persons and leaders. learned a lot of interesting and useful things like: important parts of how to start a new business, create ideas, play games as "Cashflow", an elevator speech, presentation activity "shark tank", make a team building activities, and involve myself and another team mates in activity: Make AIDA movie. We made a review of this project - presentation in JUNDA for youngsters and all interested people - showed our outcome - 2 movies and comic, shared my photos and our participants experience. 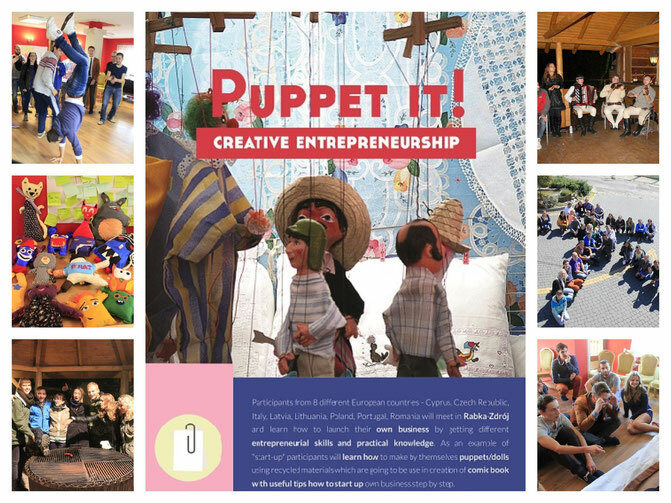 Memoviečiai had fun participated in international youth exchange creativity and entrepreneurship "Puppet it! - Creative entrepreneurship"
'' Everyone desires to learn some entrepreneurship and we also did a lot. Especially if it is done in a playful and fun non formal way. An outstanding share! I've just forwarded this onto a colleague who has been conducting a little homework on this. And he actually ordered me dinner due to the fact that I discovered it for him... lol. So let me reword this.... Thank YOU for the meal!! But yeah, thanx for spending time to talk about this matter here on your website. Thank you for sharing this post, this post reminds me of my childhood days, i really loved show. With the mushrooming growth of several PHP development companies, choosing the best PHP web development company has become really a challenging task. Read on to get a fair view. Very interesting article.It helps those people who are in this field.Keep it up! This is incredible, It's really awesome.Keep it up! Marvellous job, It's a really interesting article and keeps it up! Really done a great job! That so amazing to see that someone is promoting such kind of talent! Done a great job and this idea is so unique, creative and interesting. Like this idea a lot.